Williams - GRPL are the new Teams' Champions! Congratulations to Lorenzo and Yankess who have proven to be the best driver pairing over the course of the season. 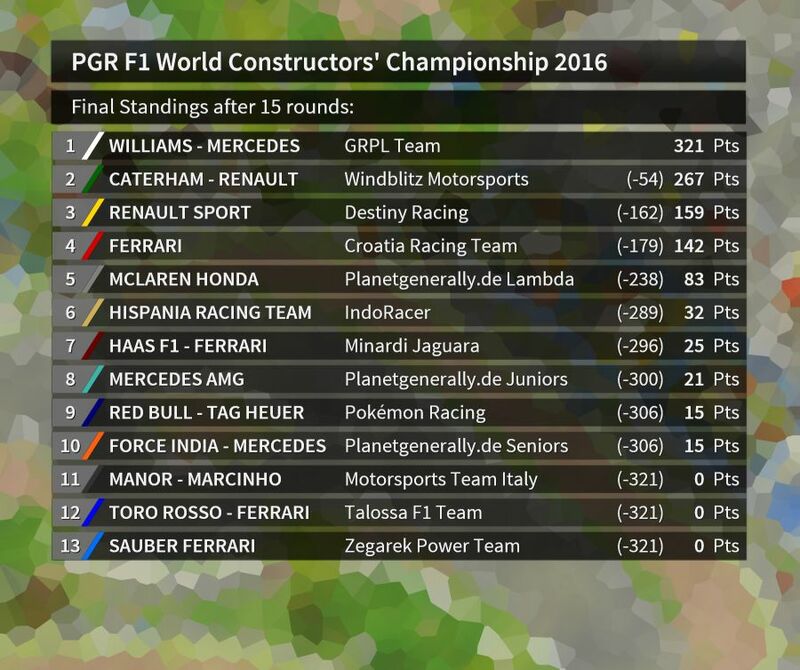 As a sidenote, just like their predecessors in 2015, both Williams drivers won the title in style, finishing 1st and 2nd. 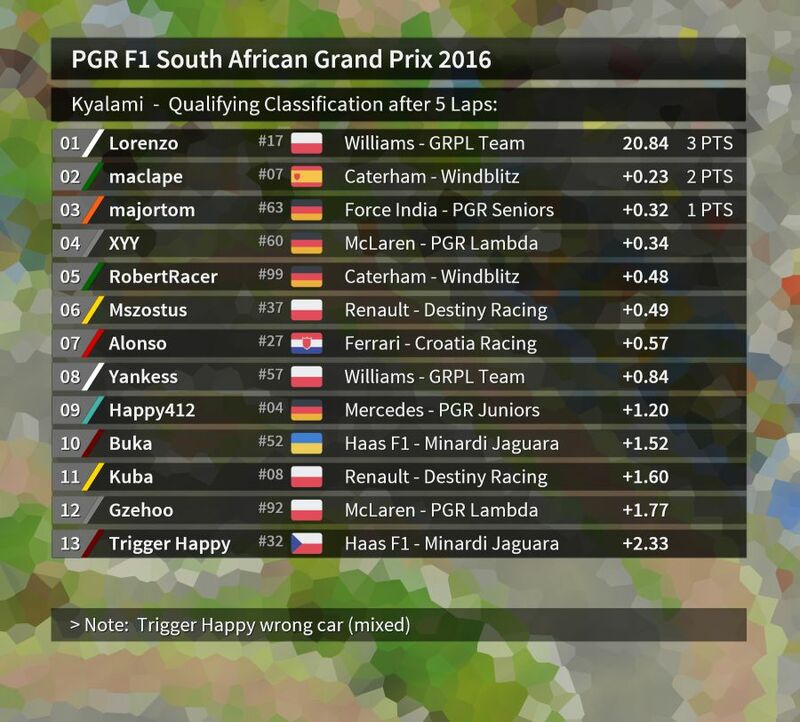 On my request XYY made the new Kyalami Circuit exclusively for the PGR F1 South African Grand Prix 2016, which is the first ever on this continent. 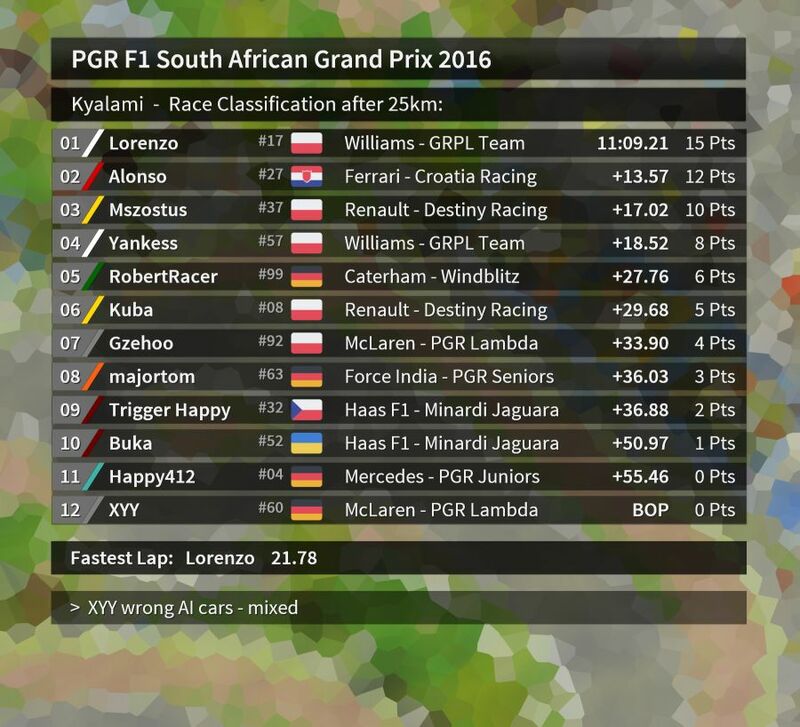 The PGR F1 version of Kyalami differs from XYY's original that is going to be released very soon. Please go and check out his final version once it's out there. Inside the track update you will also find a new and experimental palette, which I am not completely fond of but I wanted to share nontheless. You can use whatever official dry palette you like best. XYY pointed out to me that his Kyalami was made with the original GeneRally palette in mind. 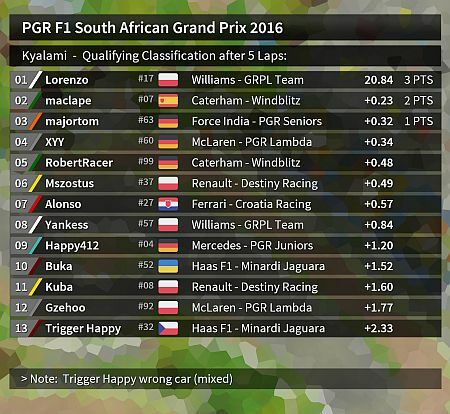 It is seven years (almost) to the day since Majortom published his first PGR F1 Qualifying results. For the past 100 Grands Prix he has been an essential member of our organizing team. Thank you! 0,23s gap in Quali - well prepared for the last Race? Every Driver with Quali starts from position corresponding to his Quali position. All Drivers without Quali must start from Pitlane. Majortom: 100 Grands Prix as an organizer, 100 Grands Prix as a competitor. Yeongam 2010 saw the closest Grand Prix finish ever in the history of the sport. 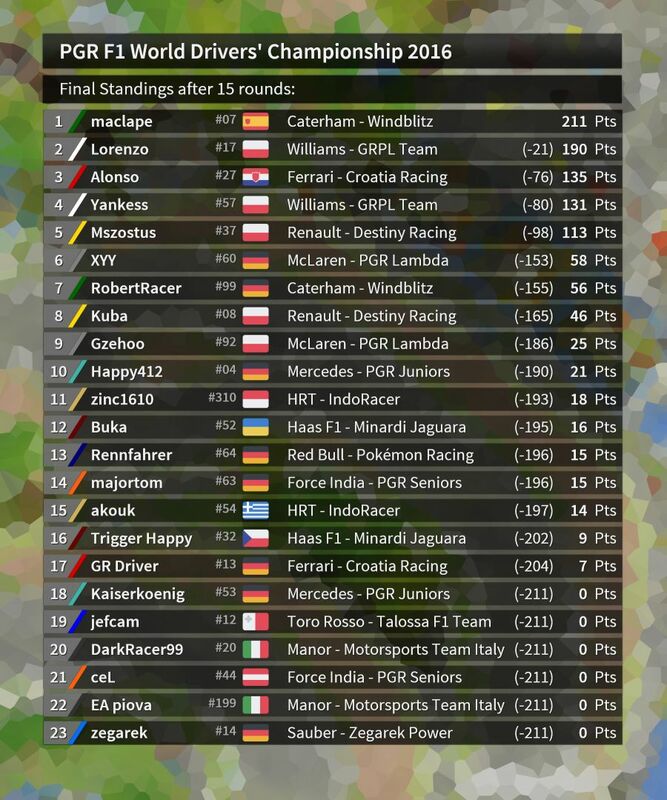 Only a few corners before the end, Ferrari's RudyOosterndijk hit a sunk tyre and former team mate Majortom was able to sneak through and secure his first ever victory in PGR F1. 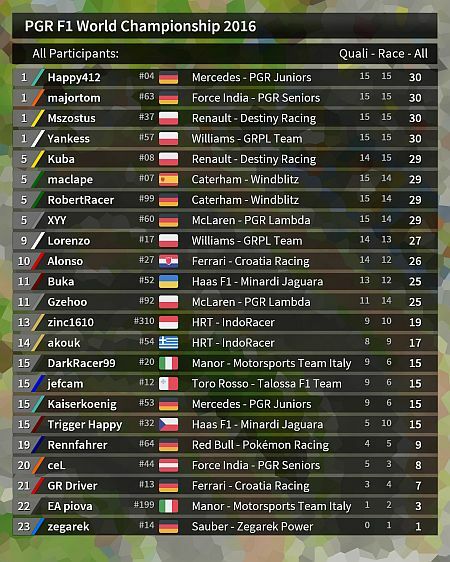 The battle for 3rd in the Drivers' Championship is still on! Whoever finishes higher wins that duel. Please do not log in, even if possible. Tracks might have to be exchanged. Login and Season 2016 is closed now - we watch for 2017! First of all. Majortom and Rudy! It was an impressive season. The best organization I've ever seen (even though sometimes it wasn't easy to follow all those rules and changes), huge devotion, responsiveness, civility and respect. Thank you very much. Second. I want to congratulate the winner of the championship. I believe that it was quite interesting to have Lorenzo and Alonso as competitors and very cool to beat them. Great job. See you in season 2017. Well, although of finishing higher (9th) than in previous season (10th) I'm not too much happy. This season was more difficult for me due to new car physic which caused some problems for me, so I wasn't able to race on 100%. 9th place in drivers' classification is more to wipe tears. Thank you very much, Buka. That is something we really appreciate to hear, especially when it comes from 1) a GR veteran who has probably seen it all, 2) a very decent driver outside the top 3 or 4 blokes in this particular competition and 3) an objective observer who is not at all involved in the plannings and who is rarely personally affected by our decisions etc. Please tell us what you mean exactly. Is it mainly about the clarifications that we made about where to drive and how not to cut corners, based on the few precedences that we saw. Or is it about the numerous combinations of settings that we use for all 3 weather conditions? Or is it about all the track updates before every session including new palettes? Or is it about the fact that our rulebook, which is basically from 2011, does not refer to so many little incidents that we have encountered over the years, leading to a lack of information about our rulings beforehand? I am not contesting your personal impression of the 2016 car physics because I thought, too, that you were struggling a bit more. But I am hoping that most drivers will say that the competition among the drivers was harder and the actual reason for their struggles. That is because I was fairly confident before the season that the cars were not too different from last year's but slower and relatively easier to drive for the wide majority. Thanks, Alonso! There will be some sort of congratulations to both the Drivers' and the Teams' Champion from our side in the not too distant future. I am checking those stats! 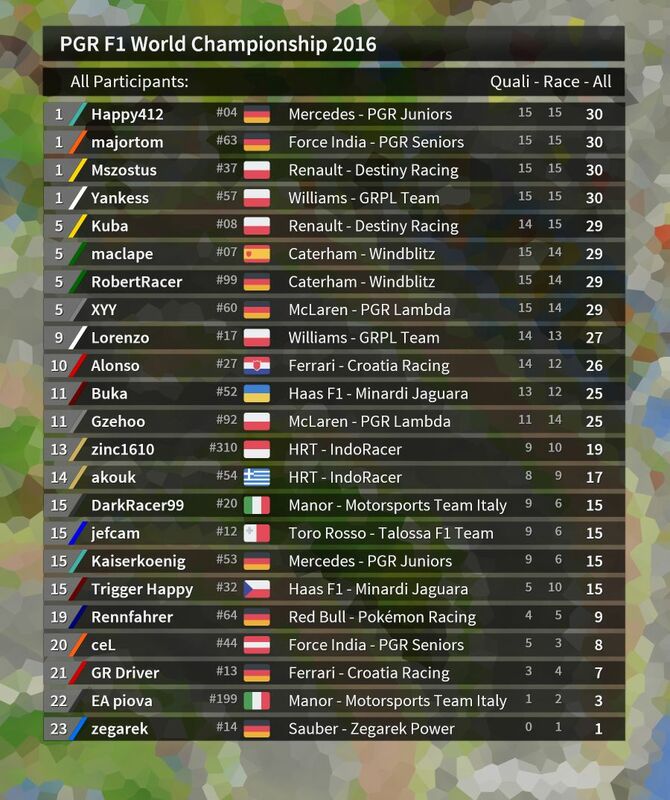 I have made the participation stats (QF, Races, QF+Races, GPs with at least one session, GPs including both sessions) myself just a couple of hours ago. And it is impressive that Kuba has not missed a single Grand Prix (but one Qualifying and one Race) since the beginning of PGR F1 on GRIF in 2011. I also like how Darkracer99 sticked around for so long this season, considering that his best result was a 13th in QF and a 14th in the race. He just kept on trying again and again. Jefcam and Akouk returned after a very long time of more than 1000 days without PGR F1. And now that I have counted the exact number of days, I was amazed that there is still one other person (not Lorenzo) who sat out even longer before his comeback. thank you for season for all opponents and congrats to Maclape! I wainting for next season, I hope that will start earlier. Maybe next season Mszostus start on Ferrari and finally win? Although I did not participate in this compo, I followed it and , can't agree more, great and constant organization, well well done! Thank you, but this is factually incorrect! You finished 12th out of 17 drivers in the Turkish Grand Prix after starting in the pits. That was your only session this year and the only session of your Zegarek Power team. Last year you completed both sessions of the Malaysian Grand Prix, scoring 3 points for a remarkable 8th place. You also qualified 12th for the Bahrain Grand Prix and 18th for the Spanish Grand Prix, in which you failed to take part, unfortunately. Your best achievement in your PGR F1 career is a 4th in both qualifying and race of the French Grand Prix 2009 at Reims, which was one of the fastest Grands Prix ever. Most of your 45 points (scaled to the current point system) were scored during the national era of PGR F1 between 2009 and 2010: 42 points. Due to your decent performances back in those days, you are currently 7th (!) among active drivers when it comes to your average race result. This is one place and a hundredth of a position ahead of Kuba. You clearly seem to be a better racer than a qualifyer with an average difference between qualifying and race result of about 2 positions. That might not sound much, but among the current drivers only Gzehoo, Buka, Trigger Happy and RobertRacer have higher numbers. The only race track that you visited twice and in different seasons is Circuit de Catalunya in Barcelona. The first time around in 2009 you finished 5th. The second time was the 18th place on the grid in 2015 that I have already mentioned. I would think my database could produce even more stats than these. All of you, just tell me what you want to know! But please, nothing too ordinary like most wins or poles. If suitable, I will try to make it a comprehensive set of data and add it to what I I have already planned to release. Or I will at least answer your question. Just as an example: "Who won the majority of the Grands Prix on Areen's circuits between and including 2009 and 2016?" Oh, thanks for the question, Rudy! Btw. that fastest lap took place in lap 20 after his only pit stop in lap 14/15. But that I had to look up myself. Total number of pit stops by the fastest 6 drivers this year versus last year in races who took place on the same track and under same weather conditions. 8 of the 15 Grands Prix in 2015 returned to the calendar in 2016. In 7 cases the weather conditions during the race were the same as in 2015. Only in Interlagos the weather changed (from dry to mixed) in 2016. These 7 races (all dry) were: Melbourne, Sepang, Monte Carlo, Montréal, Silverstone, Spa-Francorchamps and Imola. In all cases except for Montréal the top 6 drivers accumulated more pit stops than in 2015. Unsurprisingly, because we promised more tyre-aggressive settings, increasing the wear from 16% to 24% in 2016. The bottom line is that around half of these top 6 made one additional pit stop this season. Take a look at Monaco for example. RobertRacer and Alonso pitted twice in 2016, Mszostus even thrice. Just click here for the table. I am not yet decided on how to visualize all my stats. Weird feeling - Sunday's evening and no PGR F1 race to drive. Thank you Rudy and Tom for awesome season and huge work you have done! The most puzzling fact that I found is that top 5 drivers of 2016 were the only drivers who had 7 in their racing numbers. All top 3 drivers of 2016 finished on the podium 9 times of 15 Grands Prix (60 %) or 9 times out of the 11 races that the three attended together (81.81 %) - mostly with Lorenzo in 1st, Maclape in 2nd, and Alonso in 3rd (6 times). We could further add the fastest lap to this stat: In 5 times of these 6 races Lorenzo also had the fastest lap. For those you don't follow us on Twitter: We have updated the all-time-table already a couple of weeks ago. You can find the aggegrated driver stats on our website. Please take a look at the bottom of the page for custom filter options. A small version of our results database is now online as a Google spreadsheet. We have limited the results to the first 3 drivers in races (plus the fastest lap) and the first 2 in qualifyings. Make sure to use the filter options! There are numerous categories waiting for you to sort and filter: season, country of the GP/track, track autor/length, race distance, average speeds, gaps etc. Please leave us a comment in case you find a mistake. Annotations do not seem to work yet. Just click here for the Google table.